7:00–8:00 PM | Lecture and Q&A, Minnesota Street Project, 1275 Minnesota St., San Francisco. Lecture and Q&A | $30 for public, $25 for MCD members and students. Lecture and Q&A, Reception and Book Signing with Author | $60 for public, $55 for MCD members and students. The Museum of Craft and Design welcomes Parkland activist, Marjory Stoneman Douglas High School student and author David Hogg to San Francisco to share his personal story and vision for change in our country. 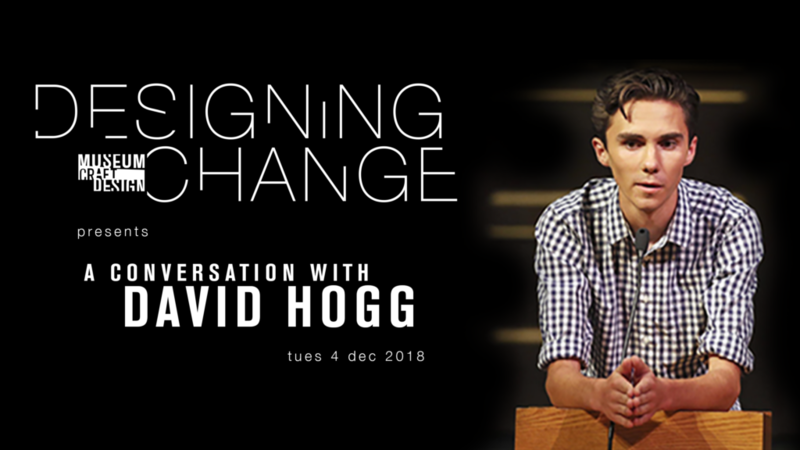 Designing Change: A Conversation with David Hogg, moderated by Brian Edwards-Tiekert of KPFA, will take place at Minnesota Street Project, followed by a reception and book signing with Hogg at the Museum of Craft and Design. Both arts venues are located within walking distance of each other in the historic Dogpatch district in San Francisco. Proceeds from this Designing Change event will benefit March for Our Lives. Concurrently, Al Farrow: Divine Ammunition, a new exhibition of work by internationally acclaimed sculptor Al Farrow will be on view at the Museum of Craft and Design. Farrow is known for his works that employ munitions–bullets, guns, grenades, bombs–to make powerful three dimensional sculptures of reliquaries and holy structures. Through his chosen media, Farrow reclaims tools of destruction to evoke peaceful social commentary. Included in the exhibition is the debut of Farrow’s latest work, White House, weighing almost a ton and created with his traditional materials of bullets, guns and steel.